Look at this bizarre cover (left). Actually, I was not attracted by it but by the central title: Richard III. Why Shakespeare made him a devil. Yes, this is the question we've wondered about more than once in our Ricardian quest: Why did Shakespeare make him a devil? Why did he choose to depict the last Plantagenet king, dead at Bosworth defending his crown against Richmond (future king Henry VII) in 1485, as the archetype of the tyrannical usurper and the most wicked of his villains? His Tragedy of Richard III, was first performed on an Elizabethan stage in 1592-93 among religious tensions, fears of civil war and foreign invasion provoked by the unresolved succession to Queen Elizabeth I. The queen was then 60 years old, single, childless and king James VI of Scotland would succeed her on the throne after her death in 1603. Shakespeare's Tragedy of Richard III was so influential that it characterized and shaped how history would look at those events for the centuries to come. But it's time we know why that happened , if there is a why. 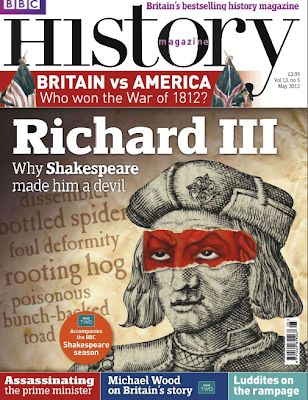 Doctor Paulina Kewes, teaching English literature at Jesus College Oxford, in her article included in this month's issue of BBC History Magazine, considers the sources that William Shakespeare used in his construction of his arch-villain, King Richard III. Thomas More had described Richard III as "little of stature, ill-featured of limbs, crooked-backed, envious, malicious, wrathful". This is the look King Richard has had in our collective imagination for so long, because Shakespeare decided to make of that deformity the characterizing physical feature of his own portrayal of the king. Not only his physiscal aspect, but even Shakespeare's anatomy of Richard's tyranny was not his own invention. He found Richard at his blackest in the second edition of Raphael Holinshed's Chronicles of England, Scotland and Ireland for the book brings together the notoriously negative treatments by Thomas More, Edward Hall, Richard Grafton and Raphael Holinshed himself and their already hostile tone was reinforced by the new editor's (Abraham Fleming) moralising comments. 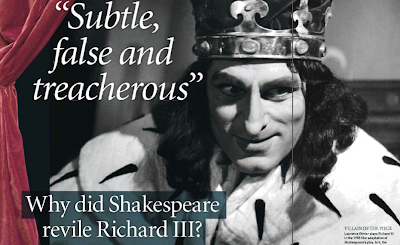 What Paulina Kewes proposes in this article is a review of the competing versions of Richard III existing at Shakespeare's time and the intriguing departures the Bard took from his sources. She hints to the fact that modern scholars such as Rosemary Horrox have challenged the unremittingly negative view of Richard III that was largely the product of early Tudor propaganda. She writes: "While hardly a paragon, the historical Richard was probably neither physically misshapen nor as premeditated in his bid for the throne as he was later made out to be. Had he won at Bosworth, the tenor of the ensuing reports would, of course, have been very different." The first main departure from the sources doctor Kewes notices is that " Shakespeare's selection of material and his imaginative transformations of it made the portrait of the king even blacker than that found in the prose historiography. For instance, unlike the chroniclers, who registered residual doubt about Richard's guilt, Shakespeare shows him directly responsible for the killing of the princes in the Tower. And he emphasises the growing public discontent with Richard's usurpation in a few exchanges involving commoners." Aside from Holinshed's Chronicles, Shakespeare also drew on two plays about Richard III previously written and staged: a three-part Latin academic drama Richardus Tertius (performed in Cambridge 1579, which widely circulated in manuscript version) and The True Tragedy of Richard III by anonymous (first staged around 1590-1 by a major professional company then printed in 1594). In her comparison between those plays and Shakespeare's masterpiece, highlighting the differences, Paulina Kewes underlines what she considers "by far the most significant fictive component of Shakespeare's play ... the enhanced role of women. (...) In Richard III, Queen Elizabeth (wife of Edward IV), Queen Margaret (widow of Henry VI), Lady Anne (widow of Henry's son and wife of Richard III) and the Duchess of York (Richard's mother) take centre stage in several unhistorical scenes that heighten the emotional intensity of the play and furnish a unique vantage point on the tyrant-in-the-making". So what was Shakespeare vision of that controversial period in history? What interpretation can we recognize in his grand historical cycles? On his reading the Wars of the Roses emerge as divine punishment for the original sin of the deposition of Richard II by Brolingbroke (future Henry IV) so order is restored when Richmond defeats Richard III at Bosworth and the Tudors ascend to the throne of England. "We now know this was far from the case", Kewes states - and we are convinced of that and definitely agree with her. There were serious political reasons for those choices: not only politicians, but also historians and intellectuals were involved in the attempt to prepare Elizabeth's succession in favour of James VI of Scotland avoiding new wars or even invasions. That is the reason why Richmond had to be presented as the agent of Providence: he was the great-great-grandfather of the Scottish king. That is the same reason why, while Elizabeth I was still alive, there were "burgeoning re-readings" of the union of Lancaster and York as the foreshadowing union of the crowns of England and Scotland (1605) with James Stewart as a new Henry VII. You'll find much more info in this highly interesting article about Shakespeare's tragedy, his sources and the historical/political reasons of Richard III's negative portrayal. So, if you are interested, grab your copy of BBC History Magazine (May issue). And if you are interested in more Shakespeare, look out for the BBC's Shakespeare Season, which is showing on BBC One, Two and Four this May and June. This is definitely one of my favorite history topics, and you did a great job of summarizing it. In addition to the propaganda element, I think that Shakespeare saw the potential for an excellent villain and made the most of it. Besides Iago, I think RIII is Shakespeare's quintessential villain. In fact, I think Shakespeare did his best creating his archi-wicked villain, worsening what was already very negative in the historical sources. Thanks, Jane for your visit and comment. From the historical point of view, reference to the Bard's sources is crucial. The "sainted More" indeed!! Don't remind me Sir Thomas was appointed one of the saints of the Catholic Church. It usually makes furious. Well, it's not your fault, of course. But I agree with you. Shakespeare turned a series of lies into a powerful characterization in a theatrical masterpiece. He needed a terribly wicked usurper and he found one in the history books of the time. Thanks for passing by and contributing your comment.